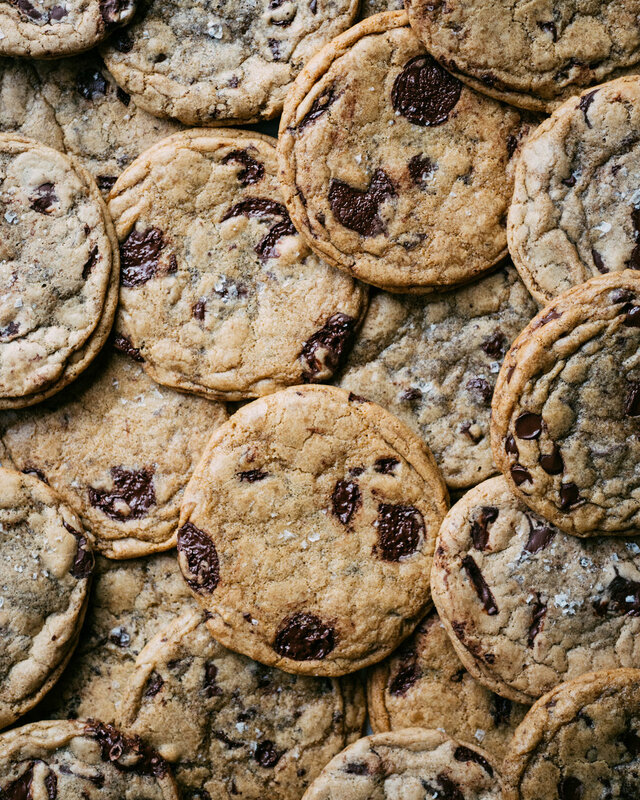 After three weeks and five of the most popular recipes around it is time for me to put my money where my mouth is and give you my perfect chocolate chip cookie recipe. Each of the test recipes were delicious and I would definitely make them all again, but in each recipe there was that perfect something that I loved. For my final recipe, my ‘ultimate’ if you want, I thought I would take these elements, smoosh them together and see if I could make the perfect chocolate chip cookie recipe. Now I should probably say there is no such thing as the one perfect recipe, this just happens to be my personal favourite recipe as it has everything I love in a chocolate chip cookie. It has crisp edges but a soft and ever so slightly chewy centre, a lot of chocolate, a good balance of sweet and salty and dough that has a good flavour of its own. All of these elements are subjective but they are what I look for in my perfect cookie. When it comes to chocolate I was surprisingly stuck over my choice. Should I use chips or wafers, the chocolate style I was testing throughout this process? I expected this to be an easy choice, going with my bias and regular use of the wafers but the chips make a wonderful cookie too and I think this comes down to exposure to bad chocolate chips in the past. Over the past eight years of working in food the only chocolate chips I have had easy access to were low quality chocolate, bulked out with vegetable oil, im talking cheap supermarket chocolate chips. This style of ‘chocolate’ (not sure chocolate made with vegetable fat can actually be legally called chocolate) is the stuff I have told you to avoid because it doesn’t melt, has a waxy taste and just work properly when it comes to baking. Thankfully Guittard, who I partnered with to create this series, make a chocolate chip that is nothing but chocolate, pure and simple. There is a difference between chips and wafers and it is important to know the difference. Traditionally chocolate chips, made only of chocolate, are made with less or no added cocoa butter to make the chocolate thicker so that it holds it shape when manufactured, whereas wafers have more added cocoa butter so they fall flat when produced. This simple difference will affect the outcome of the recipe making slight differences to each recipe. The main difference I found when using chips in this recipe is that the cookie spreads a little less than when made with wafers, but unlike poor quality chips that don’t actually melt during baking these still create those beautiful pockets of melted chocolate. When it comes to method for this cookie I basically stayed with the classic drop cookie style of the original Toll House recipe and the method used in Tara O’Brady and Bon Appetit’s recipe as it was satisfyingly simple and resulted in a delicious cookie. So melted butter it is, but taking a tip from Alison Roman we are using salted butter and taking it one step further like Bon Appetit we are going to brown it too, because why not! I also threw in Sarah Kieffer’s pan banging method because the resulting ripples in the baked cookie add texture and make for wonderful crips edges. When it comes to ingredients we are staying classic the only addition is a couple egg yolks which make for an even fudgier dough. Start by preparing the chocolate. Take about a 1/4-1/3 of the chocolate and roughly chop to break up in uneven small chunks. To make the cookie dough we first need to brown the butter. Place the butter into a saucepan and place over medium heat and cook until first the milk solids separate, then the mixture foams, and then the milk solids brown. With salted butter you need to stir the butter as it browns to make sure the salt doesn’t clump with the milk solids, you’ll also find that the foaming doesn’t dissipate quickly so you wont be able to see the browning as easily, so watch very carefully to make sure the butter doesn’t burn. Pour the butter into a large bowl and allow to cool for a few minutes before whisking in the sugars. Add the eggs and yolks one at a time, whisking until smooth and combined. Whisk in the vanilla. In a separate bowl whisk together the dry goods then add to the butter mixture and using a spatula or wooden spoon, mix together just until combined, there should be the odd bit of flour showing throughout the dough. Add the chocolate and mix until evenly distributed. Cover the dough with clingfilm and refrigerate for about 4 hours or until the dough is firm but not rock solid, you should still be able to scoop out portions without too much effort. When almost ready to bake preheat the oven to 180C (170C fan) and line two baking sheets with parchment paper. Form balls of cookie dough into portions roughly 85g. You can do this with a cookie scoop or you can roll in your hands. Place the cookies onto the baking sheets, a couple inches apart and sprinkle with a little flaked sea salt. Bake in the preheated oven for about 16-18 minutes or until golden brown at the edges but still a little paler and soft in the middle. After baking for 10 minutes remove the tray from the oven and firm bang on the work surface to collapse the cookie. Repeat this process every two minutes or so, creating a ripples effect at the edges of the cookie (this adds great texture on the finished cookies). Once baked allow to cool on the baking sheets for about 5-10 minutes before transferring to a wire rack to cool completely. Kept in a sealed container these cookies will keep for up to 5 days but personally I think these are best on the first couple days when the texture will be at its best. Note: this recipe was developed in metric measurements and with UK ingredients so if making in the US I would suggest making this with extra large eggs and european style high fat butter.